Whether it be from his own hermitage in New Mexico or from his many retreats, lectures and interview statements in the midst of his peace demonstrations, Father John Dear, SJ, interprets and projects the words and witness of the nonviolent Jesus. This he does with consummate skill and searing passion. Peace and non-violence are not just platitudes for John Dear – they are direct calls from Jesus to live a radical life grounded in self-sacrifice and self-giving. The narrow path is not easy, as Fr. Dear eloquently makes clear. It is not glamorous and can cause pain and hardship, as John can directly testify from the events that have shaped his own life; his varied experiences have led to numerous arrests and difficulties with church authorities. He nonetheless walks the path shown to him by Christ, but also as it has been lived out by countless other Christian peacemakers such as Martin Luther King Jr., Thomas Merton and Dorothy Day. In the midst of escalating violence around the world, John’s Christian message of non-violent engagement is as vital as it is radical. This wonderful film, challenging though it is, provides a way forward based on biblical truths and compassionate living. Dear forces us to reflect on our own ways of living, to read our bibles more often and to engage more fully in the wider world. An apt descriptor if ever there was one. ‘The Narrow Path’ encapsulates Fr. Dear’s message beautifully. Watch it. You won’t be disappointed. 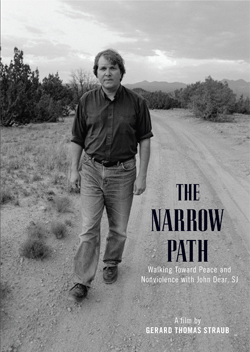 You can buy ‘The Narrow Path’ from the filmmaker, The San Damiano Foundation at http://www.sandamianofoundation.org/film_thenarrowpath.html.